Veterans heading to the Jerry Pettis VA Hospital in Loma Linda, patients with medical appointments at Kaiser Permanente in Redlands, shoppers needing a little retail therapy at Citrus Plaza and Mountain Grove Plaza in Redlands, and employees at each of these locations have a new travel option with the Beaumont Pass Transit’s Commuter 125 service. 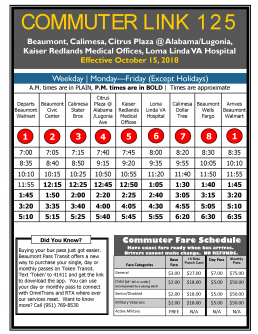 The new weekday service began in September with four morning and four afternoon loops between 7 a.m. and 6:05 p.m. 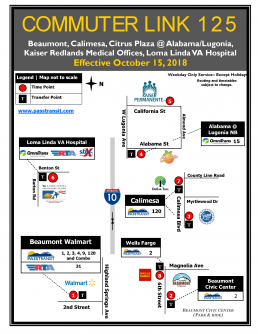 Stops include the Beaumont Walmart, Beaumont Civic Center, Calimesa Stater Bros., Citrus Plaza, Kaiser Redlands Medical Offices, Loma Linda VA Hospital, Calimesa Dollar Tree, and Beaumont Wells Fargo. Fares are free for active duty military personnel and either $2 or $3 for other riders. 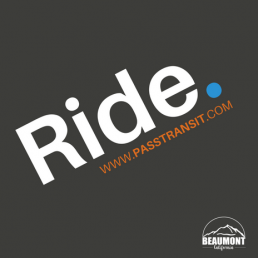 For information and bus schedules, visit the Beaumont Pass Transit website or call 951-769-8530.